My people are suffering. Black people in America, along with First Nations people, are enduring a tremendous amount of suffering in America. We suffer because our people are routinely shot dead in interactions with police. I feel the pain and suffering of my people. Before becoming a Buddhist monk, i was born Black. There are times for contemplation and reflection, and there are times to act. This is a time to act. We are living in times that require us to speak out and to act to put an end to suffering. We have heard the urgent call of the moment and we are responding. From what i am told, the Buddha expressly forbid his followers from engaging in any political activities. This officially became part of the Vinaya (or code of monastic conduct). One might wonder why this might have been? Perhaps this rule was put in place to protect the sangha from getting too wrapped up and embroiled in arguments. For sure political agitation is exhausting. At the same time, the earliest group of Buddhist monks and nuns was a “mixed” group coming from all castes and backgrounds living together. Given that they lived in India (where separation by caste is still upheld today), the very fact that they were living together was in and of itself a political statement. I’d like to share a story with you. I was once administering a standardized test to a 5th Grade class. A student raised her hand to ask about one of the test questions. There was a word used in the question that she did not know. That word was “racism”. If you’ve ever taught in a classroom you know how quickly you need to respond to questions on the spot. I told her that racism is when you assign a value to a person based on the color of their skin because you believe some people are more valuable or less valuable based on their skin color. Sounds a lot like caste doesn’t it? Caste systems do not go in reverse, they only operate one way. I can only speak to my own experience of the caste system that operates in the country of my birth, The United States of America. The way we have been socialized has some influence on how we see ourselves and how we perceive others. We carry our biases with us wherever we go. We all have “blindspots”. We have our habitual ways of being in the world that most times we are unaware of. This is why sangha is important. As a sangha we support one another by checking each other’s blindspots. For most of us, our unconscious biases are hidden in our blindspot. We need each other to point out these things for us. That is how we change and grow. The good news is that our blindspots offer us potential opportunities to wake up out of our slumber. As Ta-Nehisi Coates so brilliantly points out in Between The World and Me, race came out of racism, and not the other way around; Racial categories were created to justify a system of economic exploitation. Black bodies have been policed to death ever since. Ongoing violence against Black people today arises out of this context. Racism has always been a visceral, felt experience of danger. 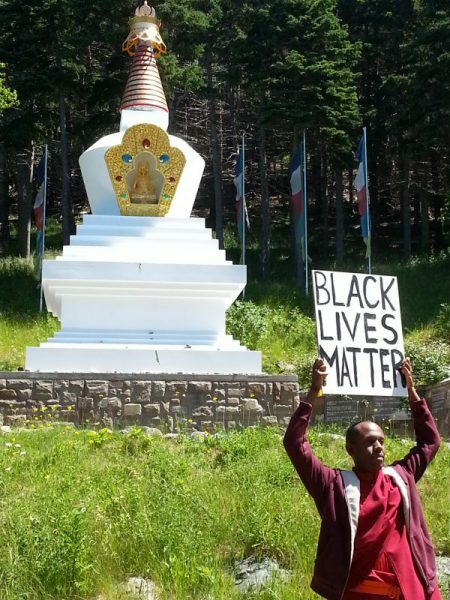 In the May 2016 issue of Lion’s Roar, Dr. Pamela Ayo Yetunde asks what Buddhism means in the age of #BlackLivesMatter? Dr. Yetunde calls for revisions of the Four Noble Truths to address the social conditions of caste in America. In my opinion, the Four Noble Truths are fine just as they are, although of course The Dharma needs to be relevant to the society in which we live. 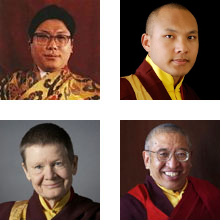 The Buddha’s teachings must be adapted to the conditions we find ourselves living in. That is what the Dharma has always done, it has adapted to fit the needs of the people living in different parts of the world. 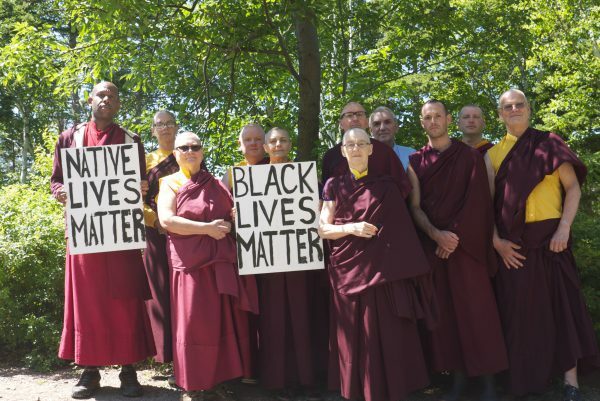 The question is not whether the Buddhadharma has relevance for Black people, but rather how well it lines up with the Liberation Theology already a part of the Black Church tradition? Liberation has always been what Black folks have struggled and died for. Every group from the UNIA-ACL to SNCC to the Panthers to Black Lives Matter all organized around the needs of Black people to be liberated from the conditions of suffering and oppression. The Dharma offers us a path to Liberation from the inside out. But there is work involved; the Dharma is all about working with our thoughts and emotions. Yes, even as we struggle to end the outer conditions that allow for the outright murder of our people with impunity, when we do the internal work we can undo our own internalized oppression. Honestly i don’t know how to keep quiet about oppression and injustice. I just don’t know how to do that. Frankly i don’t have any interest in learning either. If you believe that we will all be free, i am standing with you. If it all feels like too much, contemplative practice can preserve your sanity. This precious Black life of mine, it is a real gift. I was born to my people for a reason. Perhaps i am here to speak on our plight living under intense violent repression. If i can use my perspective and experiences as a Black man to bring an end to the suffering of my people, then so be it. If i play some small part in this i feel i will have made good use of my time here on Earth. Buddha’s final words to his followers were “Be a lamp unto yourselves”. In other words, it’s up to you to light your own way out of the darkness. Do not despair, because you have all that you need within. At your core is greatness. All you need to do is go within and fetch it! I am quite loud politically at times. I don’t refer to myself as Buddhist while I am loud and don’t consider myself Buddhist while I am politically active. I consider political expression important to the development of humanity so I do consider it to be important and potentially positive activity. On the other hand, I consider sangha precious and beyond my personal karma. I feel a need to be cautious to not drag my personal karma, negative or positive, into sangha. I try my best to keep these two things separate. 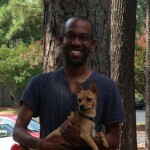 Hi Archie, thank you for taking the time to read this editorial post. i hope that you feel supported by your sangha, however much or little you choose to share of your own personal experience with them. Jigme, I appreciated your post and agree that Black Lives Matter, the sheer slaughter in our American streets is unacceptable and appalling. The shoot to kill mentality needs to be amended. I am curious to know your views on how we can bring peace to the black communities in our inner cities. I work in emergency medicine in Delware, and Wilmington, DE was christened Murdertown by a journalist a year or so ago and the name stuck.It’s so distressing to hear the trauma alerts overhead while in the charnal ground of the emergency dept, w/ the code that means shooting, and know that young men have shot each other again, not always, but most often young black men, most often in a fit of anger, for one or many “reasons”…how do we affect change? Gee Kelly, your comment sounds a lot like you are saying “But what about ‘Black-on-Black Crime’?” While i can appreciate that you have a tough job working in the ER, how can you assume to know the cause of a shooting when you are attending to a victim of a shooting? I can’t imagine the things you must see, but your comment may be shifting the focus away from what this Op-Ed was written about, and that is the use of lethal force by law enforcement. If you would like to do something to hold police officers accountable for shooting unarmed civilians there are many steps you can take to do that. In the Black community, we can use your empathy, not sympathy. Empathize with shooting victims as fellow human beings rather than problems that need to be fixed. Empathize with grieving families who have lost loved ones to police violence. Use your voice to speak out against police violence. Show up. That’s the biggest thing you can do, is show up. Come to a candle-light vigil, host a discussion at your local community center. If your city has a Civilian Review Board, get involved in conversations with local law enforcement. The “anger” you speak about is well very much linked to the conditions of poverty that people are living in. Rather than label young Black men in your city as “angry” perhaps you can get involved in some initiative to bring more resources into the poorer communities in Wilmington. More access to resources = less violence. Young people need programs that are staffed by people that care about them as individuals. Next time you find yourself with a person who has been shot, you can be a comfort to them. You can be a comfort to their loved ones, just by asking them what they need and how you can help. That is a start Kelly. I follow the President of the United States of America. His name is Obama. In 100 years people will remember him. Not because his political program. Not at all. But as a president who was singing the song ‘amazing grace’ at the funeral of 7 black young men shooted in 2015 and 2016 by police officers.I follow this song. I follow also Obama when he was shaking hands in a mosque with peaceful Muslims. This is my Buddhist view. Amazing Grace. Salam Aleykum. This is not politics. Not at all. This is the defence of human rights. Powerful, inspiring, activating! – thank you!